Nowadays, technological devices are demanding increasingly higher processing power and speed than ever before. To cope with the advances in technology, companies create various ways to achieve better processing performance. One such way that Apple Inc. found was to create the Open Computing Language (OpenCL). On June 16, 2008, Apple submitted a proposal to the Khronos Group to work on OpenCL. After five months of work, OpenCL 1.0 was released to the public on December 8, 2008. OpenCL is a low level API for parallel programming of diverse processors found in personal computers, servers, mobile devices, as well as embedded devices. The programming language for OpenCL is a C-like language. It is made to work in heterogeneous platforms containing CPU's, GPU's, and processors from such popular manufacturers as NXP®, NVIDIA®, Intel®, AMD, IBM, etc. The purpose of OpenCL is to improve the speed and responsiveness of a wide range of applications such as gaming and, entertainment, as well as scientific and medical software. Toradex's Apalis iMX6Q SoM is based on NXP's iMX6Quad processor which offers efficient processing capabilities particularly suited to multimedia applications. The processor has four Arm® Cortex®-A9 cores up to 800 MHz per core. In addition to the processor, the Apalis SoM also offers up to 2GB DDR3 RAM (64 Bit) and 4GB eMMC FLASH. Focusing on graphics and multimedia purposes, this processor also offers a Vivante GC2000 3D GPU which is capable of running OpenCL EP (Embedded Profile); therefore, we can use the i.MX6Q GPU processing power in any program. We start from the point where we already have an OpenEmbedded build system configured ready to build an image for Apalis iMX6. This can be achieved following our OpenEmbedded (core) article. For building an Embedded Linux image which supports OpenCL and includes its libraries, some additional steps need to be taken. All the code in this post can be found on GitHub. As an example, we used two basic applications which perform a simple sum of arrays. The first code runs on the GPU and the second on the CPU. The consumed time is printed after the applications finish. The header needed to use OpenCL is cl.h which can be found at /usr/include/CL in the roofts. The libraries needed to link the program are libGAL.so and libOpenCL.so. They can be found at /usr/lib. To calculate the consumed time, we created a queue with profiling enabled and got the profiling data at the end. Save the Makefile in the same folder of your applications and run make. Copy the generated binaries to Apalis iMX6. Based on these results, we can clearly see that we were able to speed up the array sum by using OpenCL with Apalis iMX6Q GPU's processing capabilities. Customers willing to take advantage of Apalis iMX6Q GPU can, among other methods, use OpenCL to increase computing power. 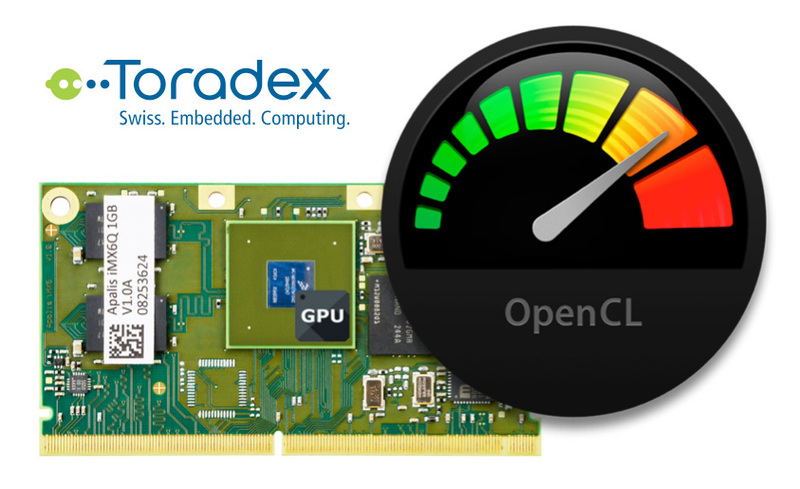 With OpenCL capabilities, it is possible to run code in devices ranging from graphics cards to supercomputers as well as embedded devices, as seen in this post. Customers could also go further combining, for example, OpenCL with OpenCV to increase performance in computer vision applications. This can be used as an example of endless possibilities of applications that a company can develop. Are you sure that OpenCL can used with OpenCV in imx6 boards? As far as I know, OpenCV needs OpenCL full profile but imx6 supports only Embedded profile. Could you clarify that? Indeed, to take advantage of OpenCL support provided by OpenCV, you need the Full Profile, but since OpenCV is a set of libraries, you could write your own OpenCL Embedded Profile functions and use them along with OpenCV functions. It's similar to the approach described in this NXP Application Note (http://www.nxp.com/docs/en/application-note/AN4629.pdf), the difference being that here they have used OpenGL, and not OpenCL, with OpenCV.